Brave souls! I do have one question: Why the sunglasses? My golf glasses. I have some golf glasses that aren’t sunglasses, but these are bigger and therefore more protective in the wind, which yesterday was blowing hard enough to make tears a problem. Great to see the SMG back even only a small group. No shorts I take it. This is technically spring, so the shorts rule is no longer in effect. And Fritz–who might have worn shorts regardless–didn’t show. You guys look like you’re going to play baseball. Played my home course, Cyprian Keyes in Mass in Sunday. I am not exaggerating when I say I was the only person on the course. Kinda nice, in a way. Cold, windy, but not too bad. No rain, just a little snow. and I broke 80, so it’s all good. This was exactly our experience (except for the breaking 80 part). I’m always amazed that people will happily play on a crowded course when it’s 90 degrees and humid, but will hide at home when it’s a little windy or wet or cold. And if you never play golf in bad weather you never amortize your investment in bad-weather golf clothing. Love playing in crappy weather! What were your layers, DO? And which couple of books are you reading? Have a good spring. The main item for all three of us was a rainsuit. It never rained (the forecast notwithstanding), but a rainsuit is also a wind suit and the wind was blowing ten or fifteen miles an hour. My theory about rain pants is you should wear them as pants, not over pants; under mine, I had on long johns. On top, under the rain jacket, I was wearing a thin turtleneck that I got as a Golf Digest freebie, a short-sleeve golf shirt, and a sweater. We all got a little hot, and we would have gotten hotter if the wind hadn’t been blowing. At some point, I ditched the orange stocking cap. That thing around my neck is a semi-insulated buff. It was overkill, but if my neck is warm I’m warm. As for books: I’m listening to The Two Towers and reading The Return of the King and Paul Israel’s biography of Thomas Edison. This photo is surprisingly Hacker-free. He didn’t show on Sunday, either! 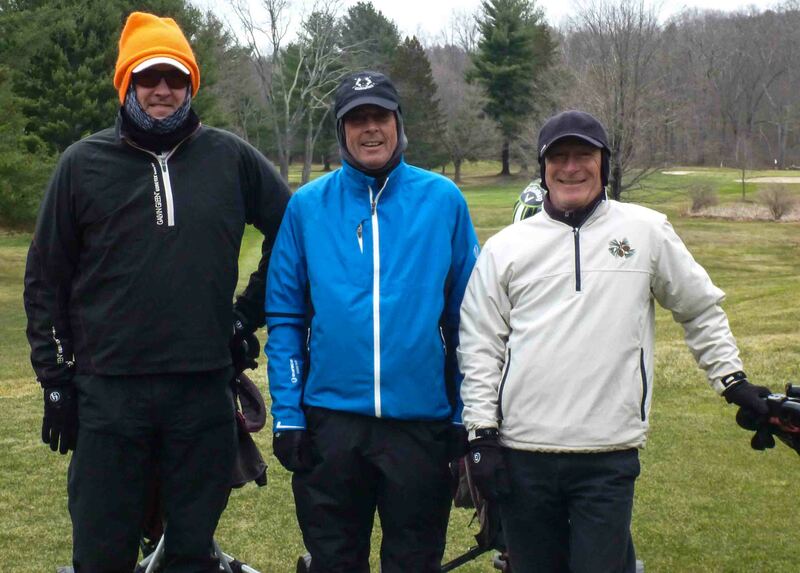 I started my golfing season in Canada last Saturday (April 21st). Surprisingly the course was not too soggy but like you, I was the only golfer there … I played a par 3 course (the big course was not yet open) and shot 30 on the first 9 but 39 on the second. Have a great season !